Note: This Chinese novel was originally serialised with Japanese names and locations. 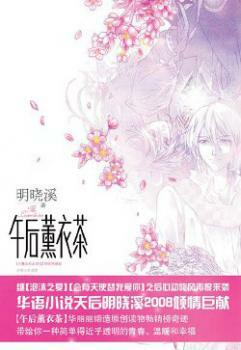 During publication, the name was changed to, “Afternoon Lavender.” The novel contained Chinese names and locations instead. SOOO SWEET! I felt that the gender roles were slightly reversed though, haha! This book is really refreshing and the female lead is such a genius manipulative female! Her personality is bright and bubbly, but she is courageous. She loves her angel and doesn't care about being ruthless in order to protect him! AHHHH SO SWEET. A fiesty but still naive female reporter who is slightly obtrusive but well meaning is given to opportunity to meet with a usually private idol, and uses the opportunity to get an exclusive scope, until she realizes that her actions were actually hurtful and betrayed his trust, hence the need to win him back. Midway through the novel, suddenly there is a group of people from a different work! ... more>> Usually, guest appearances are an interesting little addition and may push readers to check out the other work. But this time, these cameos were handled extremely bad! 1 - There weren't many named characters to begin with, but there were so many guest characters that by the end, 1/3 of the named characters were cameos. 2 - The genre of the novel shifted quite a bit with the appearance of these guest characters. Before it was showbiz - love - redemption story, after that it became yakuza - power struggle story. 4 - Some relationships between cameos were glossed over, in an attempt to get people interested in their story, but it only made me irritated - imagine watching a movie, where sometimes an unsuccessful trailer for another movie is inserted. 5 - All of the guest characters had too much presence! It was like: Oh, look, a group of PROTAGONISTS just walked in.